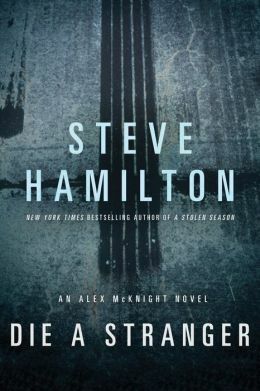 Steve Hamilton’s Die a Stranger is his 11th novel and 10th in the Alex McKnight series. He has won two Edgars, a Shamus and an Alex Award for his crime fiction, and an award from The Private Eye Writers of America. He can write. He constructs effective plots without being overbearing and his characters are worth caring about. McKnight, a former cop and sometime private investigator, is once again drawn into the evil that pervades and invades the Upper Peninsula of Michigan. He has a shady past, but his moral center carries these novels as he throws away the book and generally saves everyone from others or themselves, while trying to reconcile his conscience with his actions. In short, with McKnight, the ends justify the means. This is the second Hamilton-authored novel that I have reviewed (the first was Misery Bay), and I will admit that I mostly like his work. Objectively, this is how I depict Die a Stranger. Drug smugglers exploit the Canadian border, and, by coincidence, innocent and not-so-innocent bystanders in Paradise, Michigan, become players with life and death on the line. Vinnie LeBlanc, a sober individual with a former drunkard for a father struggles with the blurred lines between life on the reservation and a life free from his onerous past. One night after a funeral, he goes off the wagon and shows up missing. Since McKnight was LeBlanc’s caretaker during that evening of modest revelry, he must attempt to find the man when he goes missing the next morning. McKnight loses control, situations evolve, and when LeBlanc’s father reappears, McKnight pairs up with him in the quest to find the missing person. Multiple narrow and improbable escapes take the reader to the end. For me the bottom line is this: The beginning of the novel is strong and draws the reader in. A last minute plot twist (not uncommon for this genre) adds something to the ending after things have stalled out. I initially thought I would like this book – and I wanted to, but I do not think the “chase” is effective. The partnering of McKnight with LeBlanc’s father comes off as overly contrived and simply does not work. I thought this novel had a great deal of potential but it kind of got off track – or left the reservation. 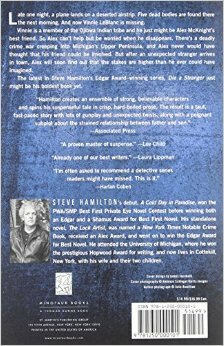 Still, this book is recommended for general readers and for fans of private investigator/private detective novels. A review copy was provided by the publisher. Dave Moyer is an educator in the Midwest and the author of Life and Life Only: A Novel.